What Does Code P0430 Mean? The P0420 and the P0430 codes are caused by catalyst inefficiency. Replacing your catalytic converter is costly, so, knowing if a new catalytic converter is needed pays off. Your car’s exhaust system (below) comprises: a catalytic converter (s), at least two oxygen sensors and exhaust pipes that route the engine’s exhaust from the engine, through the catalytic converter, and out the car. The oxygen sensors sample your car’s exhaust before and after the catalytic converter. In response to the amount of oxygen found in the exhaust, the oxygen sensors output a voltage which can be read with a multi-meter, oscilloscope, or scan tool. The oxygen sensor upstream of the catalytic converter will normally be referred to as Bank 2 O2 Sensor 1 (B2O2S1) and the downstream oxygen sensor will be Bank 2 O2 Sensor 2 (B2O2S2). 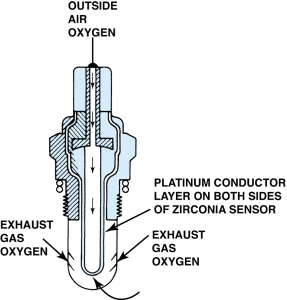 Zirconia oxygen sensors are the most common type of sensor found in cars. The sensor measures the difference in oxygen present in atmospheric air (outside air in the figure below) and the oxygen present in the exhaust gas. The percentage of oxygen in the atmosphere is 21% and the exhaust gas oxygen can vary between 0% (rich condition) and 2% (lean condition). 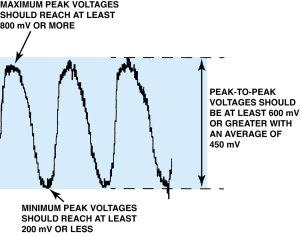 The oxygen sensor’s voltage output, which is read by the car’s computer, will decrease in a lean condition and increase in a rich condition. A normal reading for an oxygen sensor will fluctuate sinusodially between 900 millivolts (rich condition) and 100 millivolts (lean condition). Why does the amount of oxygen vary if the car is functioning properly? Doesn’t the computer always maintain a constant stoic metric mixture of fuel and air? There are two reasons: (1) catalytic converter efficiency increases when the exhaust gas mixture is either slightly rich or slightly lean so the car’s computer purposely varies the combustion mixture to increase and decrease the oxygen remaining post combustion (2) the oxygen sensor acts like a switch and is either “on” or “off” in response to very small changes in the air fuel ratio. The catalytic converter changes the chemical composition of the exhaust gas mixture. A good catalytic converter will cause the oxygen in the exhaust to react with any hydrocarbons creating water and carbon dioxide. The important thing to remember for the P0430 trouble code is that there should be no oxygen remaining in the exhaust mixture downstream of the catalytic converter. How do you troubleshoot code P0430 ? A functioning exhaust system should have a precatalytic converter oxygen sensor reading that varies sinusodially between 100 millivolts and 900 millivolts and a downstream oxygen sensor (oxygen sensor after the converter- see below) reading which is constant above 600 millivolts. If your oxygen sensors show this behavior then the catalytic converter is efficiently converting all the oxygen in the exhaust. 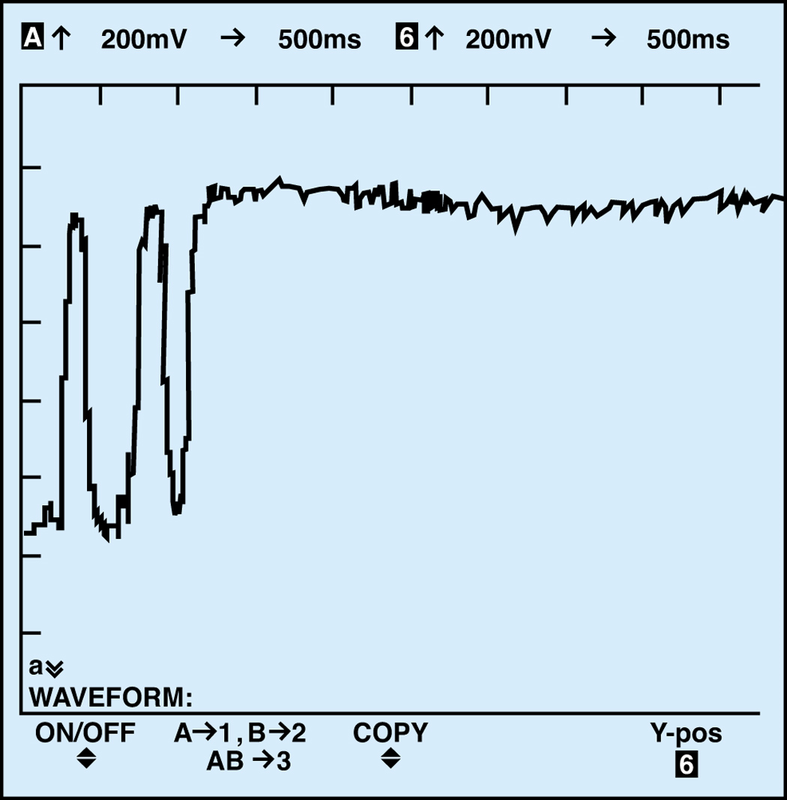 The constant high voltage from the oxygen sensor after the converter tells us there is no oxygen post catalytic converter. How do I know that my catalyst is bad? Will a bad oxygen sensor or exhaust leaks trigger the P0430 code? If both your oxygen sensors show identical sinusodial readings, it is very unlikely anything other than a bad catalyst is the cause. No combination of exhaust leaks can duplicate downstream and upstream sinusoidal oxygen sensor readings. Described below is a propane test which will verify your catalytic converter is bad. Many newer cars do not have traditional oxygen sensors. Instead the car industry has transitioned to air-fuel sensors or wideband oxygen sensors. One of the first manufacturers to make the change was Toyota. Since 2006, Toyota’s cars have wideband oxygen sensors. Air-fuel sensors or wideband oxygen sensors are significantly different from traditional zirconia oxygen sensors. 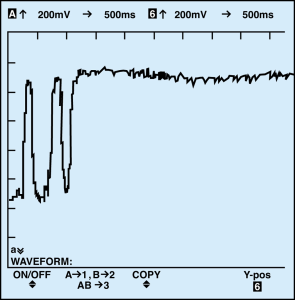 The output of an air-fuel sensor will be a constant value – gone are the varying sine waves of the oxygen sensor. 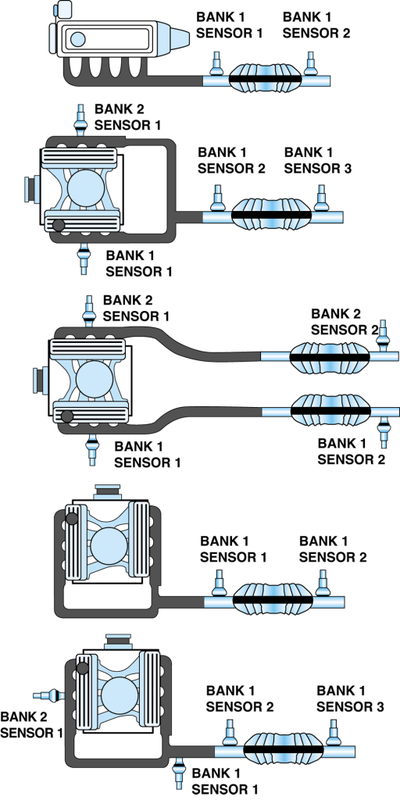 Another difference is the air-fuel sensor’s response to fuel. An air-fuel sensor will decrease its output voltage for a rich condition and increase its output for a lean condition. This is the opposite of zirconia oxygen sensors! The strange behaviour of these air-fuel sensors is caused by the underlying sampling of the air fuel mixture. Whereas, the traditional oxygen sensor could only detect a rich or lean mixture and not the degree of richness or leanness, a wideband oxygen sensor calculates the air fuel ratio with precision. The wideband sensor output for a 15:1 air fuel ratio will be different than the output for a 20:1 air fuel ratio. 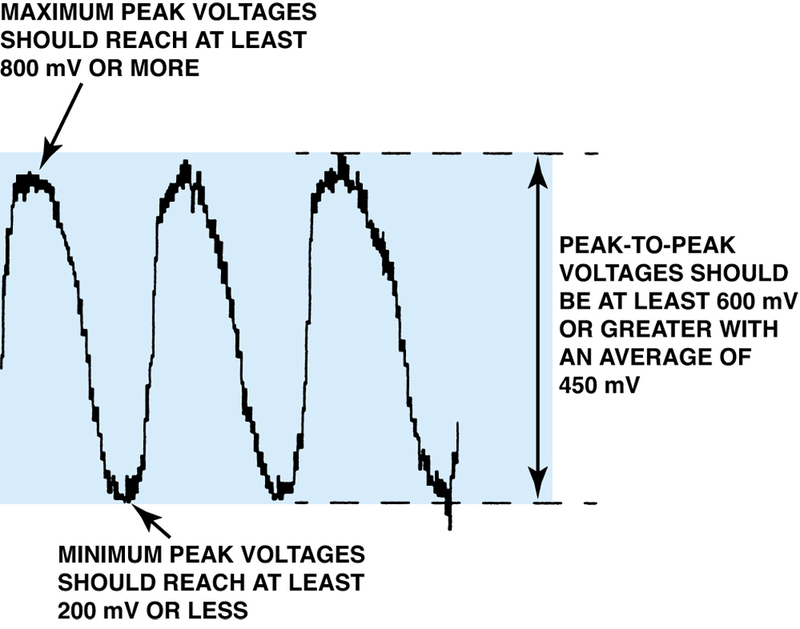 With traditional zirconia oxygen sensors both these ratios would be lean and the resulting output would be the same – a low voltage of 100 millivolts. Introducing propane into the car air intake will aid diagnosing the catalytic converter and O2 sensors. 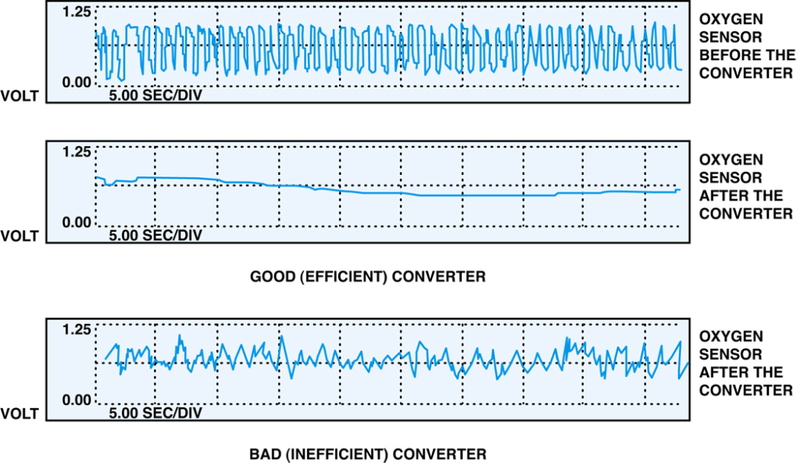 To run this test the car should be warmed up and running in a closed loop. Remember, a properly functioning catalytic converter will remove O2 from the exhaust gas. If your catalytic converter is doing its job, there will be a delay of more than 1 second in the downstream O2 sensor’s transition from the rich condition to the very lean condition caused by the propane test. If both the upstream and downstream O2 sensor respond immediately to the removal of propane by going lean, your catalytic converter is bad and is not removing O2 and hydrocarbons efficiently. 99 Navigator, 4.9l, 2x4, 140k. The damage is already done, so you could keep driving without creating any other problems. On the other hand, if you live where emissions testing is mandatory, your vehicle will not pass and you will be forced to repair it or take the vehicle off the road. Your fuel economy might suffer as well, so you’ll spend more at the pump. For a little over a year, I drove a 95 Honda Civic that had a faulty catalytic converter. Nothing happened except for causing more pollution. Your car will work fine but you’re going to have to replace the converter, if you care abour passing smog. I’ve have a rattling noise under my 1997 gmc truck near the muffler in the past few days when it first cranks up. This morning with no warning it died driving down the road. The motor turns over but does not crank. It’s making a bubbling noise out of the exhaust. The codes I get are p1040, p1041, p0420, p0430. I was going to start my changing to O2 sensors. The rattling noise is coming from the muffler when I tap it. Any suggestions? I got a 96 GMC Sierra 5 7 and I’m having the same issue…my muffler sounds like a maraca. Does anybody out here in the wide world web know what would have caused this or why it did this? And for the person with the 96 GMC Sierra SLE that is having problems keeping it running. I would advise you to have your spider changed your fuel rail it’s in your upper intake and you got to take the whole top of the motor off to do it and it’s rather pricey. it just happen to my truck ended up costing me $1,100 with the shop. I have 99 Suburban replaced all O2 sensors couple years ago. I am now getting the P430 catalytic converter system, bank 2 efficiency below threshold. Truck runs like crap ever since it threw the first P430 code. Bank 2 cat is black on the under belly, bank 1 cat appearance looks fine. These are the original cats. No other codes. I think it’s soley the cat. I have a 2006 Ford Explorer that I just replaced the plugs, wires, coil block and the battery yesterday. This morning while driving to work, the check engine light came on. When I got home later today, I checked the codes. This is what came up: ” 2 codes: “P0430…EVAP….MISFIRE….FUEL….CATLYST…..O2 SENSOR……EGR.” I’ve already checked on here what P0430 is. Would that be the only problem? I guess the new plugs might have changed the outcome. The old plugs looked like they were the originals. Thank you for any information that you can give. I just got the P0430 code with a P0606 code. I’ve been getting conflicting information on how to proceed. Some say replacing the O2 sensor will fix the codes. Another says replacing the ECM will do the same. Yet others say to replace the Catalytic converter. Can you shed some light on what you think I should do first?